After a four-month hiatus, I'm back and ready to blog. Life updates: I left my job at LivingSocial at the end of January, and started at Fishbowl Marketing shortly thereafter. I'm now a Product Specialist at a very cool company that does marketing for restaurants. Most importantly: I'm loving it. Everything else is pretty much the same. I haven't baked a whole lot in the last four months, to be honest. Without those glorious built-in vacations that I miss so deeply (boy, did I have it good as a student), and with me being exhausted when I get home from work every day, it's hard to find the time and energy. However, last Monday, I had a sort-of snow day. I've had at least three work from home snow days since I started at Fishbowl a month and a half ago. Now, I love snow. I got my mom's New England blood, and I love the cold and the snow. So when I say I'm ready for Spring, that means it's snowed too damn much. Which brings me to these pancakes. I woke up last Sunday morning with the idea to make lemon pancakes with lavender syrup. However, my box of Oreo O's arrived shortly thereafter (from South Korea- I love the internet), and I lost interest. So I made them for dinner! Very springy and delightful. 1. In a mixing bowl, whisk flour, baking powder, salt and sugar. Set aside. 2. In a separate bowl, whisk egg yolks, buttermilk, lemon zest and lemon juice. Pour into the flour mix and stir to combine. 3. In the bowl of a stand mixer, whip egg whites until medium to stiff peaks form. Very gently fold into flour/buttermilk mixture. Stir gently until incorporated but some fluffs of egg white are still visible- you want the batter to be fluffy! 4. Heat a griddle or pan to medium, and butter the surface. Drop batter into pancakes of the size you prefer and cook until the edges start to look dry- aim for golden brown. Timing is a gut thing, trust our gut! Spread butter over warm pancakes and serve with Lavender Syrup. 1. Bring sugar, water and lavender to a boil in a small saucepan. 2. Allow to simmer until the sugar has dissolved (a minute or two), then remove from heat. 3. Let steep for 30 minutes, then strain into a bowl (or glass bottle with a lid). I am alive! I truly have no idea where the last 2 months went. But I'm back now! 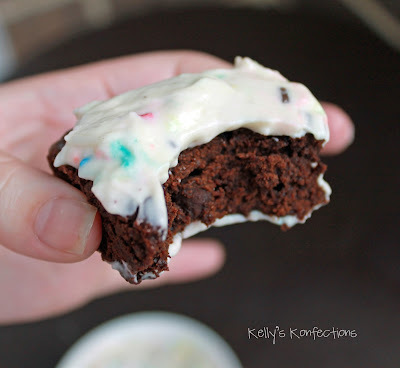 And I have yet another brownie recipe :) I should rename this blog "100 versions of my favorite brownies." I added chocolate essence and dark chocolate chips. 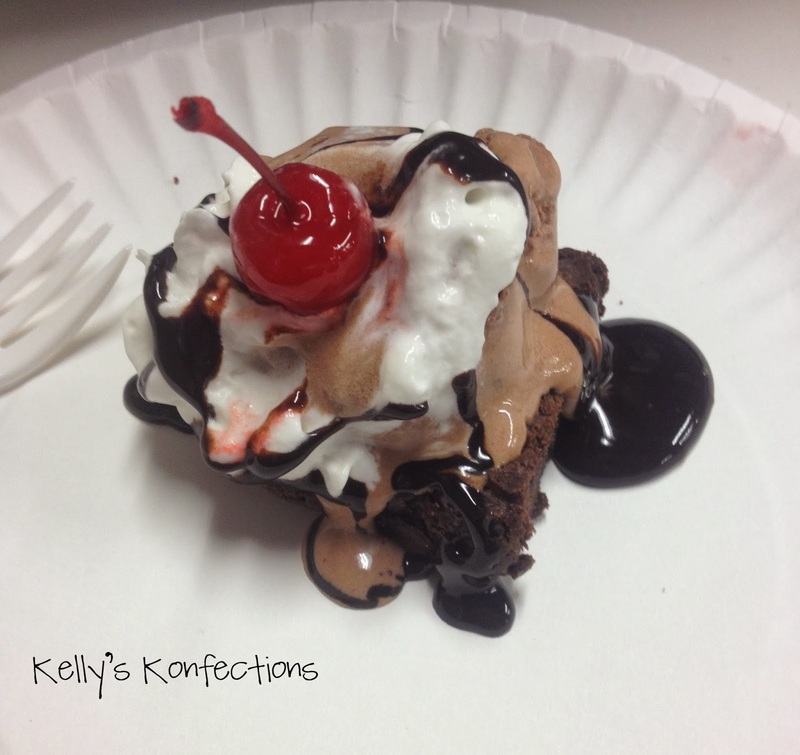 And chocolate ice cream with whipped cream, a cherry and chocolate sauce. Hello. 1. In a large heat-proof bowl set over a pan of simmering water, melt butter. Add sugar, cocoa powder and salt, and stir to combine. 2. Remove from heat and allow to cool for 5 minutes. 3. Stir in chocolate essence and vanilla bean scrapings, then add eggs one at a time. Stir until smooth. 4. Add flour and stir (40 strokes), then add the chocolate chips. 5. Prepare an 8x8" square baking pan by lining it with aluminum foil, enough that it overhangs on two sides. Spray a very light coat of cooking spray on the aluminum. Pour batter into the pan and bake at 350 degrees F for ~20 minutes. The tester should come out moist but not covered in batter. If not done after 20 minutes, pop back in the oven for 3 minute intervals (you don't want them to be overdone!). 6. Allow to cool on a rack for ~10 minutes, then stick in the fridge for at least 1 hour, up to overnight. I PROMISE my next post will come soon! There will be no more 2 month gaps! I felt lost without you... Enjoy these bad boys!! PS I got my chocolate essence at La Cuisine in Alexandria, VA, and you can get it from their online shop (which is seriously amazing, and you should definitely check it out if you aren't in the DC area). This has to be the longest I've ever gone without a post. I've finally settled into a routine, I've got my own insurance, I've taken over my car insurance and cell phone bill, and I'm about to register for a 401k! I even cleaned my bathroom last night... I'm an adult! LOL! I've also come to the realization that there's a chance I might be gluten intolerant. Well, more than a chance. If I am, it would explain the last four years of my life. I'll go into details later. But I couldn't wait any longer before sharing this ice cream with you. As a last hurrah, I decided to make cake batter ice cream... with Oreos... and eggless cookie dough balls. Because really, who cares about healthy food? And being healthy... Oh wait, I'm actually starting to care. Another sign of adulthood??? Whatever. For now, let's just eat this ice cream. 1. Whisk heavy cream, milk, sugar, cake mix, salt and vanilla extract in a large bowl. Cover and refrigerate for 2 hours (or until well chilled). In the meantime, make the cookie dough. 2. Freeze ice cream according to your ice cream maker instructions (mine took ~20 minutes). 3. 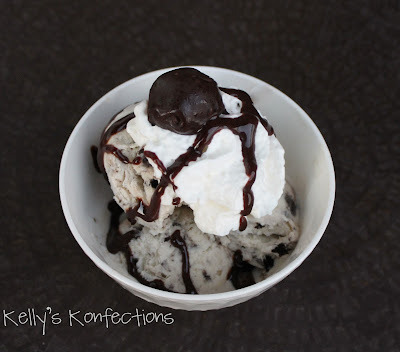 Scoop ice cream into a large bowl and stir in the crushed oreos and cookie dough balls. Freeze for another hour or so, or until it's solid. 1. Cream butter and sugars until light and fluffy, ~2-3 minutes. 2. Add heavy cream, vanilla and salt, and mix for another minute. Slowly add the flour until combined. 3. Stir in chocolate chips with a spatula. 4. Refrigerate for at least 30 minutes, then roll into small (1 tsp or smaller) balls and place on a parchment paper-lined plate. Put in freezer for at least another 30 minutes. I chopped them in half before adding them to the ice cream. Combine ice cream, oreos and cookie dough. Pig out. Repeat. Served with whipped cream and hot fudge sauce. Note: I only used half of the cookie dough balls for the ice cream. I put dunked some of the others in melted semi-sweet chocolate and froze to turn into cookie dough truffles. My favorite brownies with milk chocolate chips tossed in. And cheesecake cake batter dip. I took these into my office last week, and one of my coworkers decided to spread the dip on the brownie. It was one of the best ideas ever. This dip and these brownies are fantastic on their own, but together, they're unstoppable. They're like peanut butter and jelly, macaroni and cheese, milk and cookies. Can you tell I love food? 1. Place butter in a heatproof bowl (I used my electric stand mixer bowl) and set over a pan of simmering water. Allow butter to melt. 2. Add sugar, cocoa powder and salt to the bowl and whisk until smooth. Remove from pan and allow to cool for 5 minutes. 3. Stir in vanilla bean paste, then add eggs one at a time. Stir until smooth. 4. Add flour and stir (40 strokes). Stir in the chocolate chips. 5. Prepare an 8x8" square baking pan by lining it with aluminum foil, enough that it overhangs on two sides. Spray a very light coat of cooking spray on the aluminum, then pour the batter in, being sure to smooth it out carefully. Bake at 350 degrees F for ~20 minutes. The tester should come out moist but not with any batter attached to it. 1. Beat cream cheese until light and fluffy, about 3 minutes. 2. Add sour cream and beat until blended. 3. Add cake mix, powdered sugar and vanilla extract, and beat until blended. 5. Serve cold. 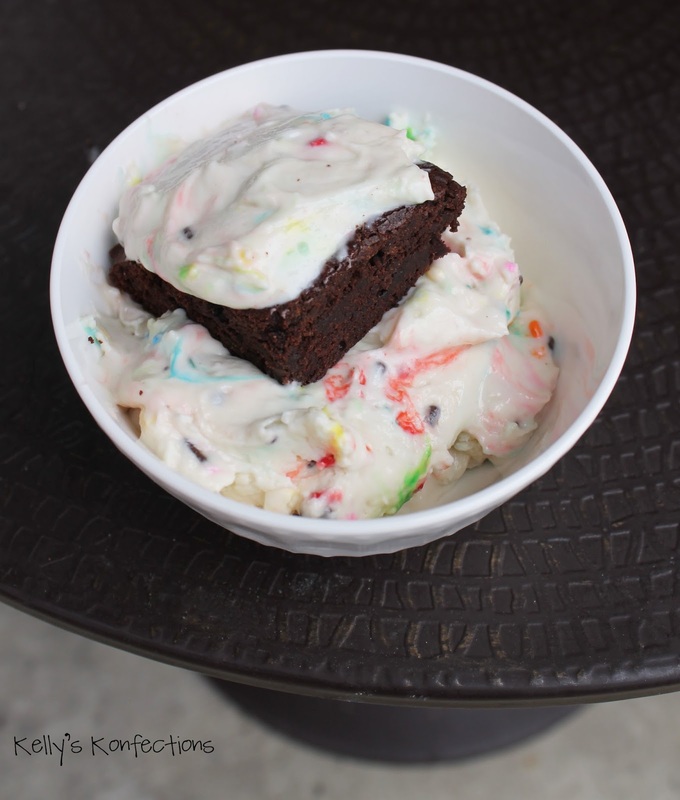 Spread over brownies, or serve with graham crackers or fruit.